Delayed Nail Wraps: A Shipping Update! CLICK HERE TO VIEW EMAIL UPDATE. TL;DR: Large Order + Overseas Shipping + Holiday Shipping Volume + Shenanigans = Our shipment got separated and somewhat lost it seems. Some boxes have been located and arrived (Vampires NX & holiday designs, which have shipped already) and more have been located, and we are waiting for them to arrive at HQ. Some boxes with designs are still missing, but as we receive things, we will be shipping them out. We are here with a much needed and deserved update on delayed nail wrap orders. We know that many of you have been waiting very patiently and we again apologize for the lack of updates and extended ship times. We thought we'd be able to obtain better, more detailed info and news by now. It would seem that a portion of our production order got separated from the rest in shipping and the Nerd Misfits have been scrambling and sleuthing to pinpoint which designs and orders are those affected by this. In other words, a number of designs are lost to the shipping gods, and we are doing our very best to retrieve them. 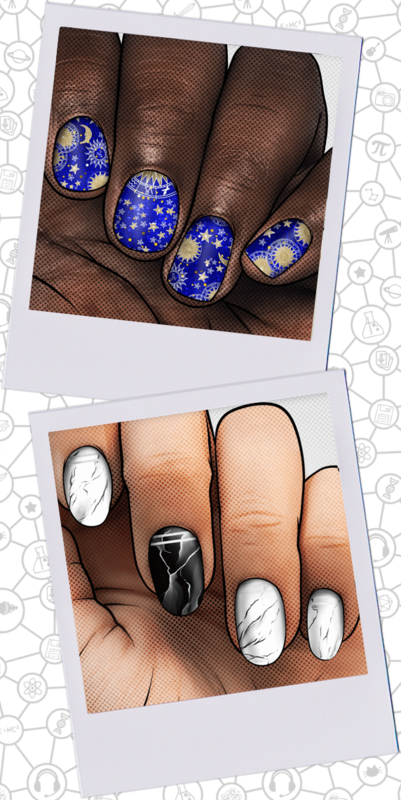 You may have noticed by now that Vampires NEXUS and our holiday nail wraps officially reached HQ. Those boxes were lucky enough to have successfully completed their journey to us without further hiccups. We shipped these designs out asap. We've also been working to get a running list of the designs that are still lost and have offered to separate orders, etc. to try and best accommodate everyone during this misstep. Our shipments are not often lost and this is something we typically do not have to address. Production delays are one thing, but trying to find a lost shipment is a whole other beast and we are determined to defeat it. The good news is that a portion of these boxes have now been recovered and are once again on their way to us. We have also been assured that it's only a matter of time before the final boxes are located and rerouted as well. Because of this new info, we can offer our best shipping estimates on the remaining designs. *If your order DOES NOT contain one of the following designs, then you can expect your order to ship in February. Our aim is near the middle of the month, but please be aware that depending on when we actually receive this recovered shipment, it could be closer to the end. We just want to be as transparent as possible. We will try our very best to make it as early and quick as possible come February. We are pleased that many designs have been located, including our Sass & Sorcery NEXUS wraps and many of the new and exciting Featured Artist designs, so please be on the lookout for those next month. To wrap up this novel of an email, thank you. Thank you to all of you for sticking with us through this and demonstrating your understanding and faith in the Nerd Misfits. We appreciate and adore you.